LiquidCrystal lets you use small character type displays. Characters and a limited set of custom symbols can be used. 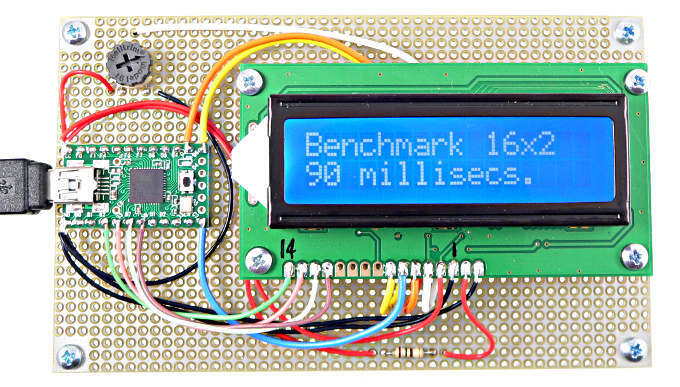 LiquidCrystal & LiquidCrystalFast work with Teensy and Teensy++, and all Arduino boards. Nearly all character type displays have a 14 pin interface. Often 2 extra pins are added for power to the backlight. Pins 1 and 2 must be connected to power. A 10K potentiometer is used for contrast adjustment, with the center pin connected to pin 3. The two outer pins of the potentiometer connect to +5 volts and ground. Only 6 signal are required, RS, Enable, D4, D5, D6 and D7. The R/W pin must be connected to ground. Pins D0, D1, D2 and D3 are left unconnected. LiquidCrystalFast can use the R/W pin for faster access. Either way can update the display faster than a human eye can detect, but if your project needs to do other work, less time updating the display may be worth using a seventh pin. LiquidCrystalFast can also access large 4x40 displays, which have two enable pins. Create the LiquidCrystal object and specify the 6 pins where the LCD is connected. You can connect more than one display (each to its own pins) and create a separate LiquidCrystal objects for each. Initialize the display and set the size. Create the LiquidCrystalFast object, using 7 pins. Create the LiquidCrystalFast object for large 40x4 display, using 8 pins. This example can be loaded with File > Examples > LiquidCrystal > HelloWorld. Most LCDs run on 5 volts, but are able to receive 3.3 volt signals from Teensy 3.0 or Teensy 2.0 modified for 3.3 volts. The 6 signal (slow) connection only transmit to the LCD. All 6 lines can be connected directly. For more details, please refer to the official LiquidCrystal page. LiquidCrystalFast was written by John Raines in 2010. The Arduino developers had planned to include it into Arduino 0019, but appear to have abandoned plans to use John's improvements. LiquidCrystal can use 8 all data pins. However, careful benchmarking with found little speed advantage. With R/W used by LiquidCrystalFast (which does offer nearly a 4X speedup with most LCDs), 8 pins is actually slower due to the Arduino pin number conversion done to switch the extra 4 pins from input to output. LiquidCrystal offers an option to use the R/W pin, but internally the code never makes use of that pin. If merely drives that pin low. If you want the R/W speedup, only LiquidCrystalFast actually makes use of the R/W pin. Another new LCD library also aims to improve upon LiquidCrystal.